British Prime Minister Gordon Brown: "Our [Afghanistan] strategy is the right one"
LONDON, England (CNN) -- Britain's prime minister on Saturday grieved over the losses of 15 British troops over 10 days in Afghanistan, but underscored that preventing terror from reaching the UK streets was the top goal. 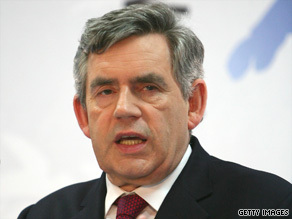 British Prime Minister Gordon Brown, shown at the G-8 summit earlier this week, says troop deaths have hurt him. "The last 10 days have been extraordinarily difficult. My thoughts are with the families of the brave servicemen who have been killed. The sacrifice that they have made in the service of our country will never be forgotten," Prime Minister Gordon Brown said. "While I know there are some who have questioned our strategy, I continue to believe our strategy is the right one." Meanwhile, Afghan and NATO-led troops on Saturday killed a militant thought to be linked to a Thursday attack near Kabul that led to the deaths of 24 people, including a dozen schoolchildren, the U.S. military said. The troops located and killed Mohammed Aajan, known for carrying out roadside bomb attacks against civilians and troops in Logar and Kabul provinces. The military said Aajan "was given the opportunity to surrender peacefully" before the operation started. Brown's remarks were made in a letter dated Saturday to parliament member Alan Williams -- chairman of the Liaison Committee on the government's policy in Afghanistan and Pakistan. The British military marked a grim milestone Friday when the number of troops killed in Afghanistan surpassed the country's military death toll in the Iraq conflict. An especially bloody 10 days in Afghanistan's troubled Helmand province -- from July 1 to July 10 -- claimed 15 British military lives, putting the number of dead in that conflict at 184, the Defense Ministry said. The British military has lost 179 soldiers in Iraq. The United States and Britain have been engulfed in war with militants in Helmand, a major poppy-growing region and a base of operations and support for the Taliban and al Qaeda movements. British forces and U.S. Marines are engaged in efforts to secure population centers, and Brown cited a major operation called Panther's Claw intended to drive the Taliban from central Helmand. "It has been a very difficult summer and it is not over. But if we are to deny Helmand to the Taliban in the long term; if we are to help Afghanistan and Pakistan to defeat this vicious insurgency and prevent the return of al Qaeda, then it is vital that the international community sees its commitment through." He said the "immediate priority is to ensure security for the population in the run-up to the presidential elections in August." In the letter, Brown explained his stance, saying that when the Taliban controlled Afghanistan eight years ago, it harbored the al Qaeda terror network that attacked the United States on September 11, 2001. "So in 2001 the case for intervention in Afghanistan was to take on a global terrorist threat and prevent terrorist attacks in Britain and across the world," he said. "In 2009 the overriding reason for our continued involvement is the same -- to take on, at its source, the terrorist threat, and prevent attacks here and elsewhere." The ousting of the Taliban led al Qaeda to take refuge in northwestern Pakistan near Afghanistan. Brown said a top security official in Britain has said "three quarters of the most serious plots against the UK have links into these mountains." Brown said the fight in Afghanistan and Pakistan involves clearing terror networks, supporting elected government, and fighting the heroin trade that funds terror. He said progress in one of the countries "will never be sustainable without progress in both." "So our purpose is clear: to prevent terrorism coming to the streets of Britain. Our security depends on strengthening the Pakistan and Afghan governments to defeat both al Qaeda and also the Pakistan and Afghan Taliban," he said. Brown said it is in Britain's interest to train Afghan forces and back Pakistan's armed forces. He said Britain "is playing a leading role in international assistance to Pakistan" to help people displaced, such as those during the country's offensive in North West Frontier Province. "And as Pakistan steps up the fight on terrorism so we will focus greater attention on the basic human challenges it still faces, in education, health and respect for human rights, in each of which failure serves only to fuel radicalization," he said, citing hundreds of millions in pounds of assistance. Brown talked about the U.S. increase in its military presence and noted Britain's April announcement of increasing its troop contribution to 9,000 for the election time. He explained that the military effort to clear a region and establish security would be buttressed by Afghan plans "to build basic services -- clean water, electricity, roads, basic justice, basic health care, and then economic development." "This inevitably takes time, but the important thing is that work has begun, to give the people a stake in the future. One of the first signs of this will be polling stations for the Afghan presidential elections opening in areas where previously that would have been impossible," he said. "None of this could take place without the fearless work of our troops." He also said roadside bombs and not "direct confrontation" are causing the recent U.S. and British casualties. "From April we started to deploy additional units to tackle this growing threat," he said.